We don’t have to live our lives weighed down with labels and baggage. In Christ we have a brand new identity and the promise of “Overwhelming Victory” despite the trials and tests of daily life. Monica Schmelter is the host of Bridges a daily Christian television program on Christian Television Network (CTN). For more information on Monica, please visit her website at www.monicaschmelter.com. Labels are things that people see on the outside. Baggage is the stuff we carry inside that people may or may not see. Stage Right will have one wardrobe rack and one table with luggage on it. Then on Stage Left there will be two wardrobe racks. The speaker will be standing in the middle of these items. Go through each label and talk about it briefly. What are some of the labels that you been assigned/believed/worn? What are some of the ways these labels have affected you and impacted others? Baggage: Things we hold inside our hearts that weigh us down. Others may or may not know about the “baggage” we hold inside of our hearts. Speaker goes to baggage table and gets a piece of luggage and opens it up with notes inside. Speaker will ask for a volunteer to tape the “baggage labels” on the outside of the luggage after going through each one. What kinds of baggage are you carrying? How does the baggage affect you and impact others? Are you willing to consider letting go of the labels and baggage? How many of you are familiar with the show “What Not to Wear?” This is going to be a little similar to that. By faith we are going to throw away the labels and baggage we’ve been carrying (The Identity Crisis). After you throw out the labels and baggage, you will be presented with an “Overwhelming Victory” card. The speaker will ask volunteers to pass out two blank labels to each person to fill out one is for a label they are dealing with and the other is for baggage they are dealing with. In the next session we’ll start our “Identity Makeover” with a clean slate and God’s promise of “Overwhelming Victory” Let’s start Throwing Away the Labels and Baggage! Play fun and energetic song for everyone to come throw their two labels in a big garbage can. 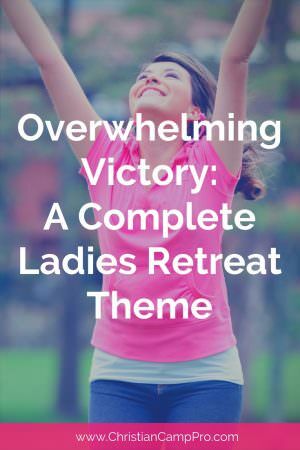 Overwhelming Victory is Yours In Jesus Name! Hold Up Empty Trash Cans! Have you got your “Overwhelming Victory” cards? Let what God has done for you speak louder than anything that ever happened to you. Share an impactful personal story that relates the the verse above. This is how we re-write our story by faith. We accept graciously what’s happened. We refuse the world’s take on it – and we by faith see it through God’s eyes. Look at what you wrote (answered) earlier and select one favorite thing that God says about you and write that on a larger label that you can hold up in a group picture. Let Him Fill Your Cup with Overwhelming Victory! Group picture from platform of the audience holding up their Overwhelming Victory mugs, shirt or other gift item. Special thanks to Refreshing Mountain for sponsoring this article.